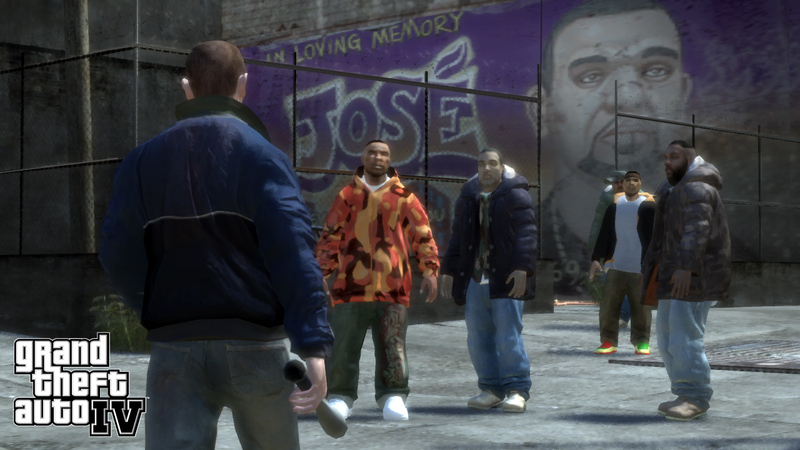 Comment: As you drive around Liberty City, flipping between radio stations, absorbing the inanity of their commercial messages and the bilious hypocrisy of their small-minded politics, you realize that the America of GTA IV is a country coming down from its trip. The humor – some crass, some clever – errs towards the absurd, as the series has always done, but never before has it been so cutting, so impassioned or so relevant. Filtered through the world-weary eyes of Eastern Bloc immigrant Niko Bellic, the American Dream is all strung-out, sapped dry from the coke-fuelled megalomania of the ’80s, paying in full for the arrogance of its ’90s empire-building – and what little remains is at the mercy of relentless subdivision, as everyone tries to carve off a little piece for themselves. Even the criminal organizations familiar to previous GTAs are at the end of their game: fractious, desperate and doomed. It’s unforgiving stuff – an evisceration of America’s insularity, its gluttony, its petty suburban miseries, its lethargy and artificiality. As funny as GTA IV is, this really is laughter in the dark – brilliantly observed, unnerving and bitter. This may seem a bit heavy for a GTA game. It is, after all, a series which delights in tooling you up for celebratory moments of carnage. No player of the previous games will be unfamiliar with the experience of standing on a rooftop, gleefully taking down police choppers with a bazooka as support teams screech to a halt down below. Other games have since pared down the genre that GTA first created into entertaining confections – sandboxes which exist solely for the joy of their destruction. It is probably GTA IV’s greatest achievement that it eases the player from this mindset. Yes, there’s still the freedom to cause havoc, and inevitably you do; the difference is that you’re no longer impelled to toy with GTA IV’s world in quite the same sadistic way – you live in it. This adjustment of tone sees the eradication of the more frivolous, preposterous elements of GTAs past. There are no jetpacks this time around, clothing remains within credible limitations, and helicopters are the most outlandish things you will commandeer. There are no hidden packages, the jumps are fewer and less conspicuous. GTA IV manages to coax you away from casual mayhem by loading you with more meaningful commitments – simultaneously stepping away from and surpassing the kind of peripheral distractions that were to be found in San Andreas. GTA IV undoubtedly represents a progression for the series in just about every way – some achievement coming off the back of something as ambitious as San Andreas. In some ways it simply furthers the formula, but by drawing a world of unmatched depth and interest, it has managed to transcend the cliches of the genre Rockstar first created. But while it’s bold enough to move away from the shallow thrills of ever bigger explosions, it elects not to radically rethink some of the more masochistic elements of its predecessors, leaves some edges a little rough, and surprises you with the occasional cheap trick. Comment: Grand Theft Auto IV ( GTA 4 ) is newest game ( near GTA 5 ) in this searial of Grand Theft Auto games. This game have very good graphic and its very detail. I don't love this game so much because Rockstart didn't optimized this game good for PC and now they are moving GTA 5 realese date two years to no make same mistake ( this is for Pc versions ). That bad optimize can be fixed with patch. This GTA is like other where you live your mafia or ganster life, but unlike other GTA games before this, is more realistic. Comment: Grand theft auto 4 is the sequel of the grand theft saga. In this sequel you are given plenty of new and exiting missions. This game kicked off the GTA series even more because of the online play feature. A great game that everybody should try. Comment: Here we have really good new game . This is one of my favourite games from GTA . One of the best for sure! In this game you have possibilites to do what ever you want , that means that you don't have rules in this game. You can play this game with doing the missions but that're really bored and personal i don't like that , but i like to do what ever i like in town . You can do a lot of things , but the bad one is that you can use cheat for money , for guns , for police and some other that i used to know when i was younger . When you are doing crazy things in town , you can kill people and get their money , sometimes you kill man/women and they throw money+gun and that's wierd but ok , you can steal cars / motors and drive through the town , go to the villages which you can't see on map . You can make cops chasing you , steal police car and they will try to get you , kill one policeman and they will chace you . You have some levels of chasing police , you have 6 stars and that's hard to get but it's possible. When you steal car you get 1 star , when you kill officer you get two start , and there are some other , when you steal their helicopter that's 5 stars and when you kill someone with that helicopter that's 6 stars and i don't think so that you can get out , cause police is trying to find you with : policemans , cars , motors , helicopters , tanks , boats , you don't have any chances i think! Beside these stupind things , you can do some good , like doing missions , but that's really bored . On start missions are so easy , you can do 10 per day on start , but later , missions need time and a lot of experience to go throught them and that's making them really hard . 70 procent of missions is to kill someone , on start that will be one man/women , after it will be few of them , then whole band , and sometimes you need to go in helicopter and kill some number of people in town , there are some other misions , like to kill someone and get something from it , and drive that in car on the other part of time to sell to get money , or give someone ( I remember that mission ). My expression about game : It's really awesome game , i really like it and when i have some free time i really enjoy playing it. Marks for the game : Graphics are awesome so 10/10 , sound is awesome too so 10/10 , animations are pretty good do 9/10 , gameplay is good so 8/10. For all game i will give 9/10. I would reccomend this game to people who likes doing some crazy things in game , like killing other people in town , fast driving , get chased by police and some other. AWESOME game.!! Comment: Grand Theft Auto is a very great game for adults only because it has a very bad influence to the children. You are able to control the character whatever you do, killing people, carnapping, doing mission and befriend with the people in the map. Your main goal here is to finish the mission and it is very funny when you know the whole story of the character on how he lived in the US. There is also a cheats for everything, unlimited health and armor, weapons and the unlimited ammo, to control the city, and everything. There is also a cheat for the vehicles which you can see it in the game. but i think it is aon funny if you use cheats unless you only want to play and don't get serious about it. You can roam around the map, go wherever you want, enter houses and many thing just like in real life but the difference is you play the game but in the real life, you live it. You can kill people but the cops will catch you for murdering. You have two choices, to be killed or to be bursted by the policemen. In playing this game is very addictive. You should be wise in playing this game because it really waste your time. Aside from that, the game is very good and fun to play. It has great graphics and really a nice game for you. Keep playing this game and have enjoy in playing to experience the beauty of the game. Comment: Grand Theft Auto IV's story mode can be beaten in less than 30 hours, although the side/story missions are quite fun. Comment: i give 10 cuz the swingset glitch is awesome so are the graphics and weapons and the creators finally realized the game is better with cheats!!! Comment: the best game ever in the world!!!!!!! Comment: I love it! Lots of missions, lots of killing people which is funny in animated style! I give it a 9 out of 10!